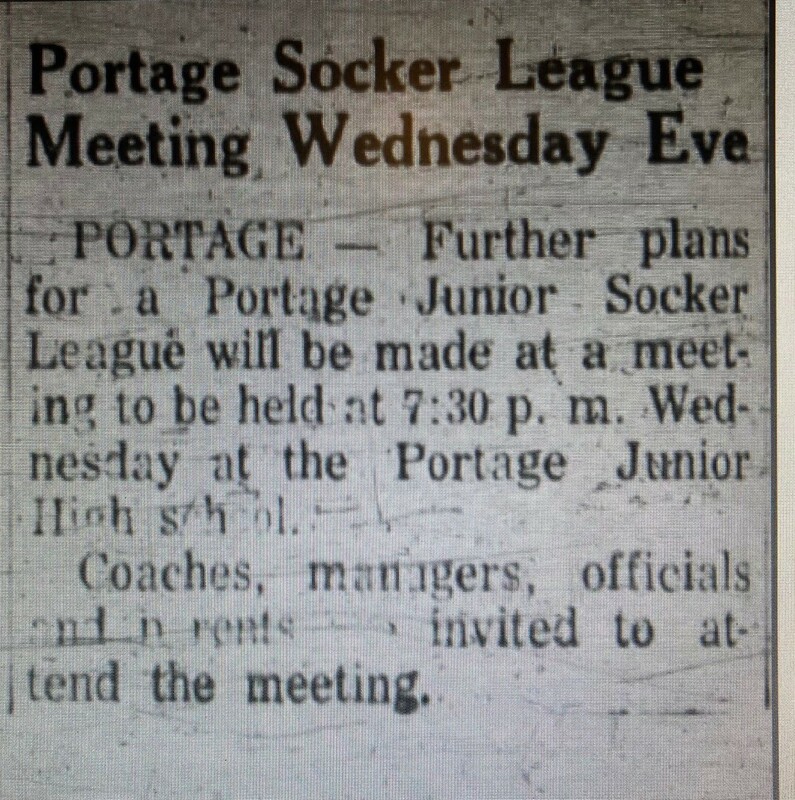 An initial meeting to discuss the league was held on Wednesday, July 17, 1967. 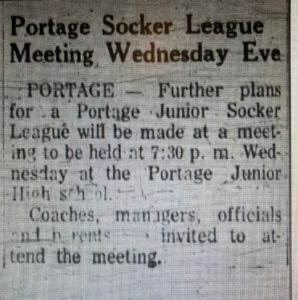 The Vidette-Messenger article announcing the meeting said Portage Socker (vice soccer). 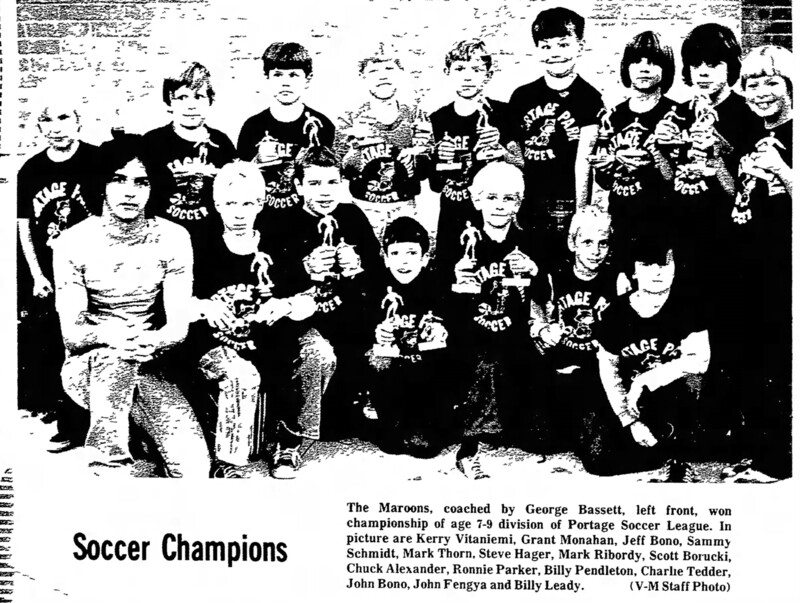 It wouldn't be the first misspelling that first year. 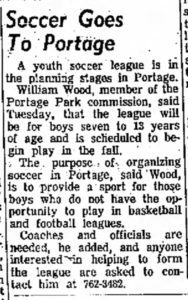 Registration fees the first year were $2 per child. 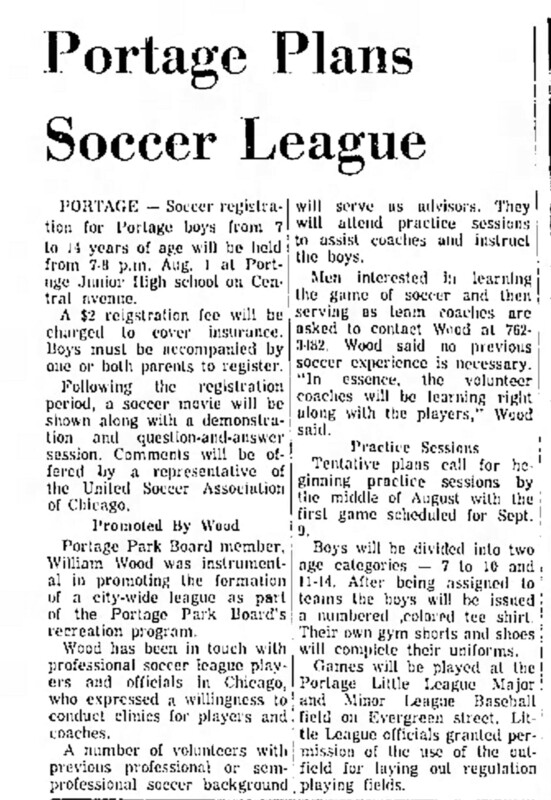 Registration was on Tuesday, August 1, 1967. 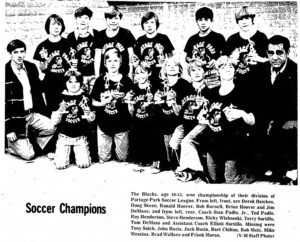 There were 113 boys that played that first year. Play began on Saturday, September 9, 1967. 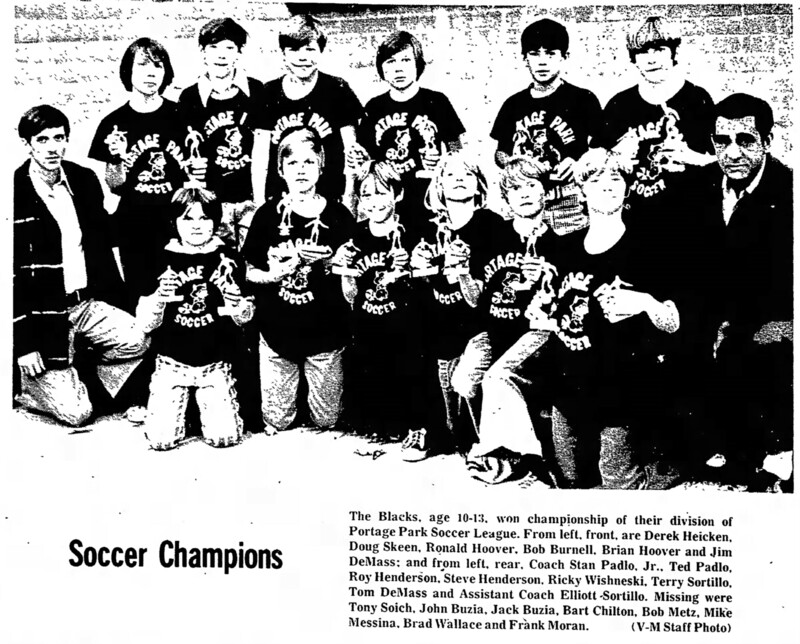 There were a total of eight (8) teams divided into two divisions of four (4) teams. The American League was for players 7-9 and the National League was for players 10-14. 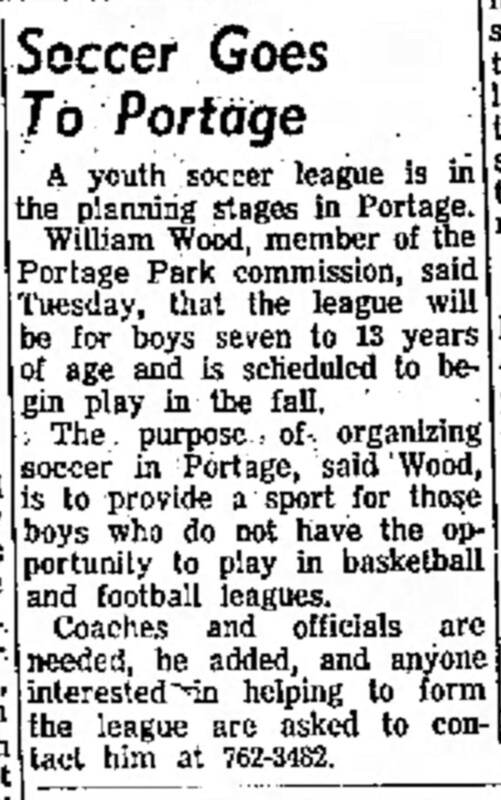 (Note: Initially the plan was for divisions to be split between 7-10 and 11-14, but signups dictated a change). 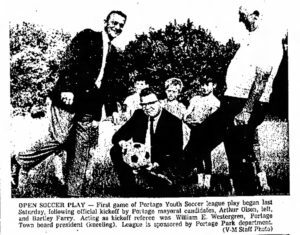 Though initial plans were for the games to be played on the Portage Little League fields on Evergreen Ave, the games were played behind the then Portage Jr High School (later Aylesworth Jr HS). 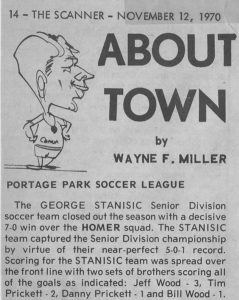 Play concluded the last Saturday of October 1967 (before the 1st City election in November). 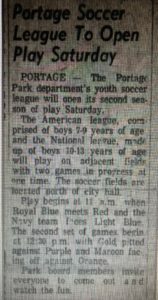 Winners were: American League the Red team coached by Thomas Schmidt and Ewald Millsaglevich, and in the National League the maroon team coached by Wayne F. Miller, Folmer Nyby and William Theodoras. 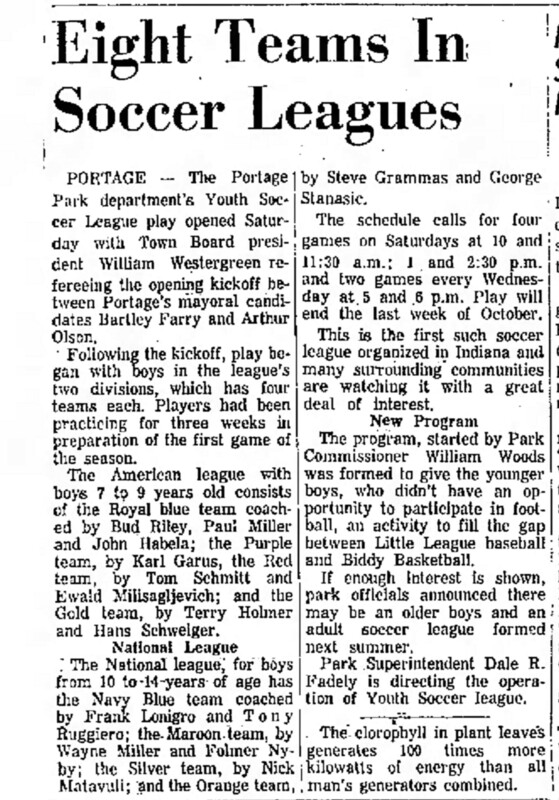 At the time it was reported that Portage's Park Department league was the first organized youth soccer league in Indiana. 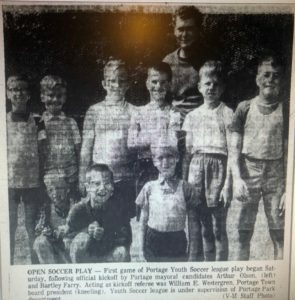 At least four (4) of those first year players would play soccer in college: Dave Grammas at St. Francis of Ft Wayne, Jeff Wood and Bob Miller at Tri-State/Trine and Mike Nix at DePauw. 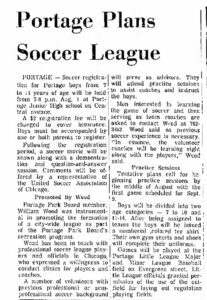 Grammas and Schmidt would be long time successful coaches for Portage in the future Northwest Indiana Soccer league (NWISL), while Matavuli would be a successful coach for Ogden Dunes in the NWISL through the early 70s, before moving to the Bloomington, IN area. Matavuli is a member of the Indiana Soccer Hall of Fame.2 Stanasic would coach teams in the Park System for a number of years. 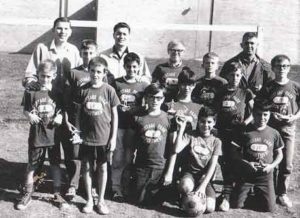 Kai Nyby, a member of the winning Maroon team, would earn the distinction in 1971 of being the first American to score a goal in soccer in Russia.3 The team he was playing on, Match International, was coached by 1st year Parks coach Nick Matavuli. 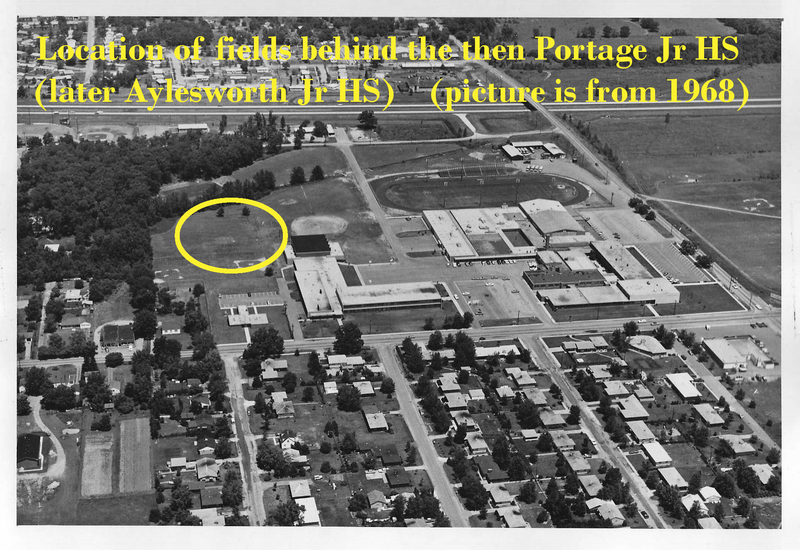 Note backside of Portage Jr High School (later Aylesworth Jr HS) (gymnasium) in background of picture. You may be able to make out Postage (not Portage) on the shirts. A player that first year, recalls playing but the only game he specifically recalls is the last game of the year when the maroon team he was on defeated the Silver team for the National Division championship. 'It was a hard fought game, decided by one goal." 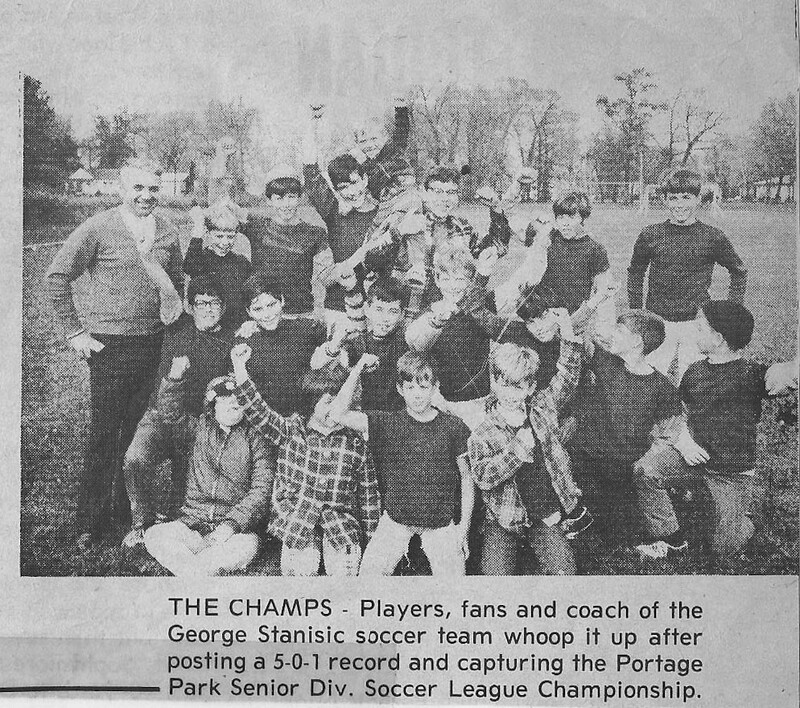 The two teams had played earlier in the season to a tie. 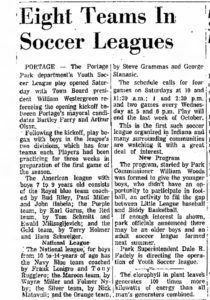 The Silver team was primarily composed of players from Ogden Dunes. 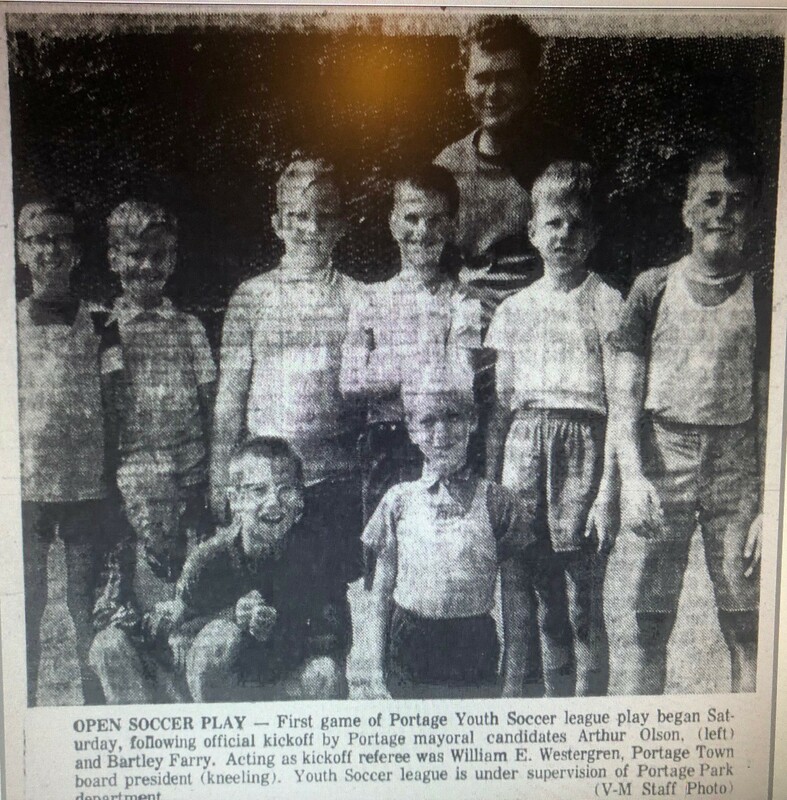 The Maroon team had several players from Ogden Dunes as well. There was wide disparity in ages on some of the teams, especially in the National League. 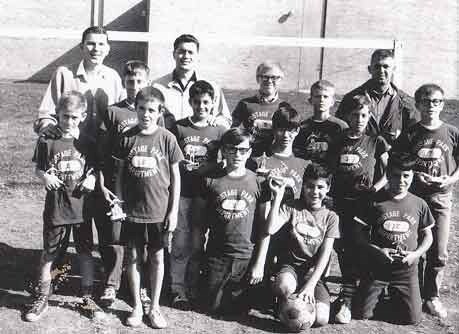 For example, the Maroon team had ninth graders (G. Miller, J. Johnson and K. Nyby) as well as a 4th grader (P. Theodoras). 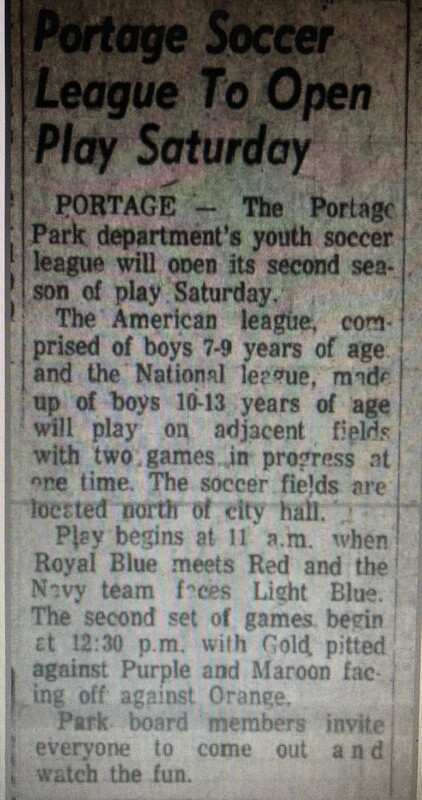 You wouldn't see that today, five grade/age difference in ages. 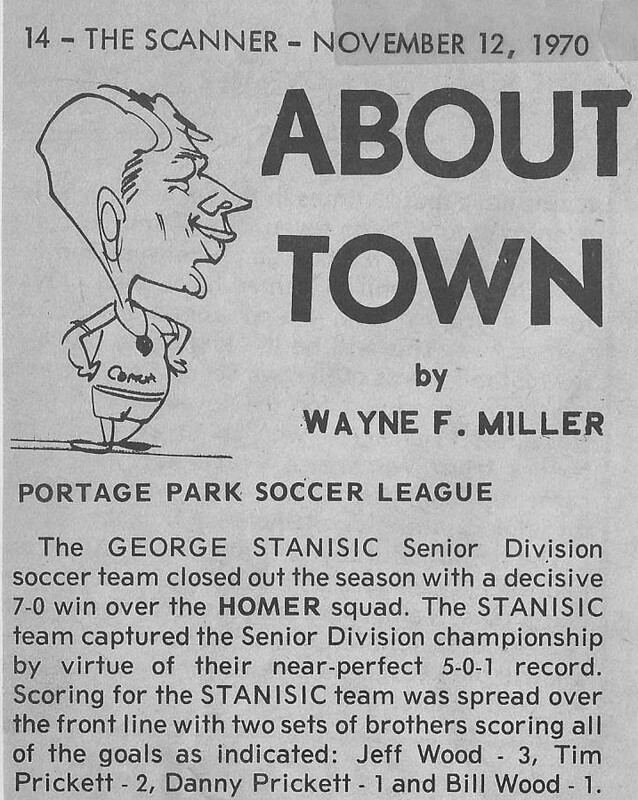 A player that first year, along with Bob Miller and others recall that the shirts provided to the players had a typo. 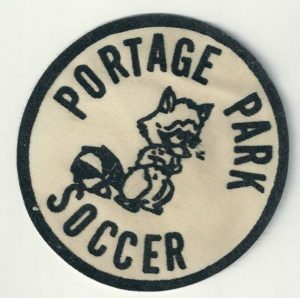 The shirts were printed "Postage Park" vice "Portage Park."